...that had the potential to be a perfect weekend! It all started on Friday, with my day off due to my compressed work schedule. I was able to sleep in as late as I wanted to, since my parents had taken the dogs back to Pittsburgh the day before. I took full advantage of this, and along with a lack of sleep throughout the week, I got out of bed after noon. It was a well needed rest, because I knew that I would be up very late that night! This brings us to the first part of the weekend. Kristi and I were headed up to the Rams Head Live! up in Baltimore to go to the Sister Hazel concert. It was a fairly late show, with the band coming on around 10:00 and playing for about an hour and 40 minutes. They just released a new album in August called Release, so they played a number of the new songs, plus some of the older stuff! They are one of Kristi's favorite bands and it had almost been 2 years since we saw them last! It was a great time, despite the annoying Baltimore girls that were near us! After the concert, we took off on a long drive to Pittsburgh. As I said before, I slept all morning, so I didn't have much trouble making the drive and we arrived at about 3:30 am! It was off to bed and then we slept in until about 11 on Sat. Once we were up and ready, we were off to have lunch with friends to celebrate Peter's 31st B-Day! We had a little bit of time that afternoon before we had to get ready for the next big event of the weekend, the Penguins - Devils game at the Igloo!! 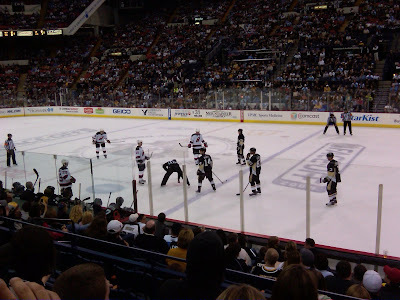 There was a chance that this might be my last trip to the Igloo before the Pens move next door in 2010, so I decided to splurge and get us some good tickets. We were a few rows back in the B section near the corner. Unfortunately, we were at the end of the ice where the Pens only shot once, but it turns out that would not matter, since the Pens only scored 1 goal! After starting off the season 9-1, we were pretty excited to see them get their 10th win. But that was not going to happen that night. Despite the outcome, and the fairly poor play, we enjoyed our view and had a nice time anyway! We decided as we were leaving, that since it is still early in the hockey season, we would trade a loss against the Devils for a Steelers win against the Vikings! Speaking of the Vikings, that was our next big event on the weekend. 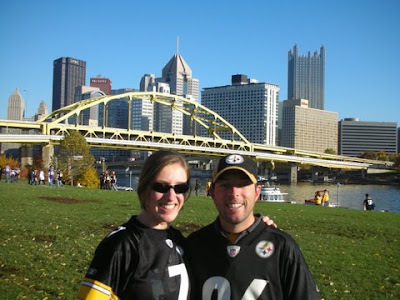 We slept in again on Sunday morning, got our Steelers gear ready, and headed down to the football game!! And what a game it was going to be... For the 3rd and final live event that we were going to last weekend, it sure was a big one! When we decided to go to the Vikings game, Brett Favre was still retired. We had no idea that this was going to be the defending champs taking on a very surprising undefeated Vikings team. It ended up being an amazing game, that the Steelers won. It might have taken a few good plays by the defense, but they pulled it out. I was glad to see Favre play in person and to be a part of the largest crowd at Heinz Field to date. It was a busy and action packed weekend, but it was a good one! Thanks for stopping by my blog!! I just wanted to return the favor . 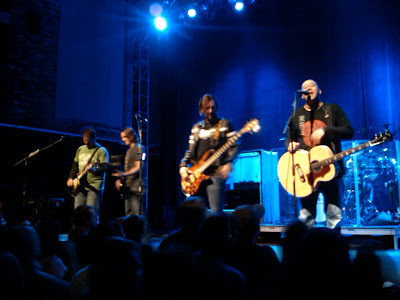 . . also, I'm okay with the Sister Hazel concert. I am NOT okay with the Penguins game and CERTAINLY NOT okay with the STEELERS. So kidding . . .
Hope you'll stop by again! I adore hockey games. So much fun!